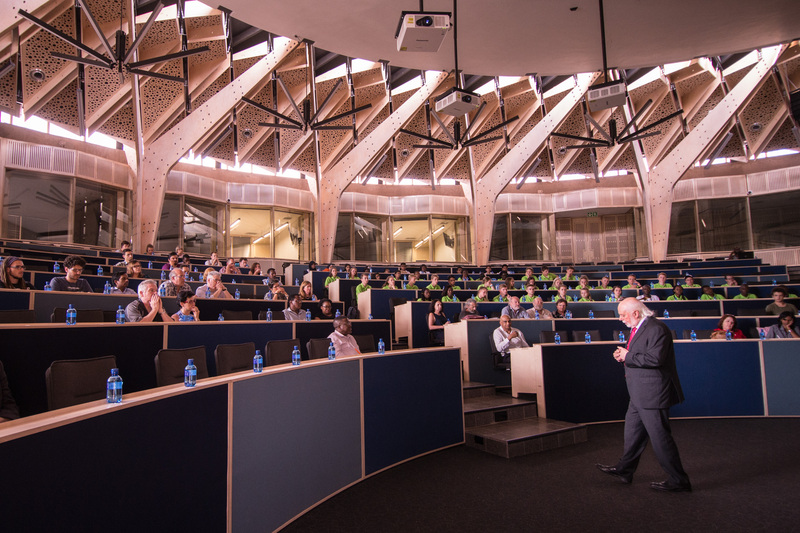 The University of Pretoria was proud to host 2016 Chemistry Nobel laureate Sir Fraser Stoddart recently, when he spoke at UP’s Future Africa campus. In his lecture, Sir Fraser said that, to be successful as academics, teachers should prioritise their students’ needs and put them ahead of their own. Furthermore, they should support their students through thick and thin. of the University of Strasbourg in France and Bernard L. Feringa of the University of Groningen in the Netherlands, for the design and synthesis of molecular machines. These machines, which convert chemical energy into mechanical forces and movement, have already found use in chemistry as more sophisticated catalysts and in materials science for the production of scratch-resistant polymers. 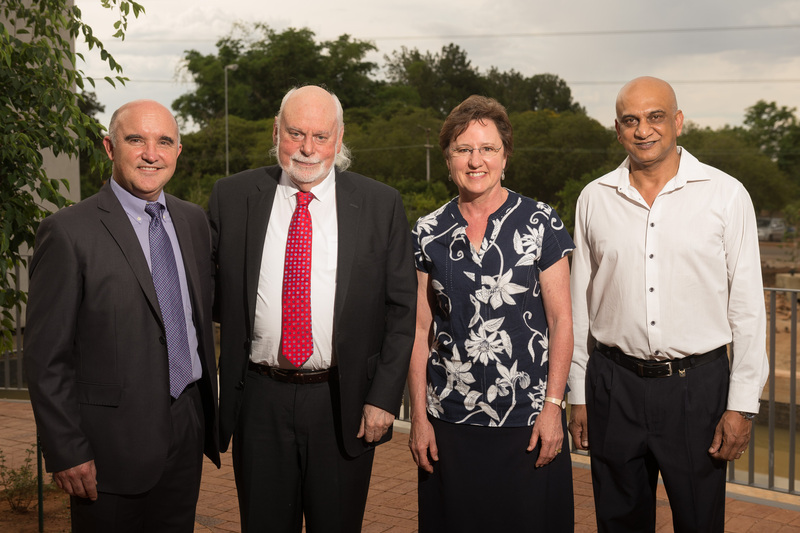 Prof Edward Webb, Deputy Dean, Research and Postgraduate Education, Faculty of Natural and Agricultural Sciences (NAS); Sir Fraser Stoddart; Prof Marietjie Potgieter, Deputy Dean, Teaching and Learning, NAS; and Prof Vinesh Maharaj, Head of Department, Chemistry. Sir Fraser also announced in 1991 the synthesis of a molecular shuttle, which is a mechanically interlocked molecule composed of a dumbbell component with two equally probable recognition sites along its axle for a ring component which jumps back and forth between the two sites about 2 000 times a second in acetone solution at room temperature. The molecular shuttle served as a prototype for the design of a molecular switch and ultimately a molecular pump. Sir Fraser entertained UP staff, students and school learners with his lecture. Apart from his introduction of the mechanical bond, which has led to the fabrication of artificial molecular switches and machines, Sir Fraser is also a leader in molecular nanotechnology. His work has implications for information technology and healthcare. PanaceaNano, a company which he formed in 2014 in partnership with Dr Youssry Botros, formerly the Director of Academic Relations at Intel Corp, is producing age-defying cosmetics using nanotechnology, under the brand Noble.